Leading Exporter of semi tubular plates, one third tubular plate, distal femur plate, lc lcp 4.5 mm broad with locking system, locking compression plates and distal femur locking plates from Ahmedabad. Leveraging on our profound experience of manufacturing, supplying, and exporting a huge gamut of Tubular Plates we are presenting Semi Tubular Plates to our valued customers that are of immense use in orthopedic fixation procedures. We manufacture these by stringently following global norms. These are made from the best grades of metal alloys that are procured from authorized vendors of the industry. Our implants are widely used in major hospitals by renowned surgeons and are appreciated for their unmatched performance. We adhere to rigorous norms of quality and hygiene in accordance with global standards while manufacturing these implants. We are backed by sound industry knowledge and vast domain experience of manufacturing, supplying, and exporting premium orthopedic implants. We offer a large gamut of Tubular Plates including One Third Tubular Plate to our prestigious clients. 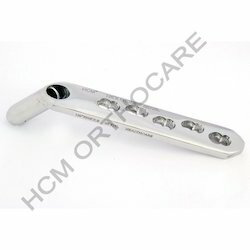 These are commonly used for fracture fixation procedures and are made by using modern technologies from the best grades of metal alloys in our state of the art facilities. 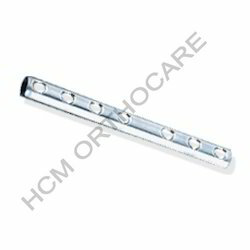 These Plates are extensively used by leading doctors across the globe and are appreciated for their outstanding features. These are available in various specifications such as number of holes, and spacing between holes. We offer these in various sizes at industry leading prices. 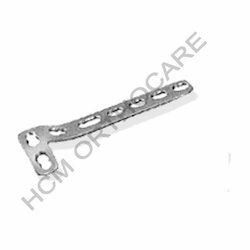 Being a quality centric organization, we offer a quality range of Distal Femur Plate with Locking Systems. Our product range starts from 5 Hole to 13 Hole. We offer these at reasonable prices to our clients. 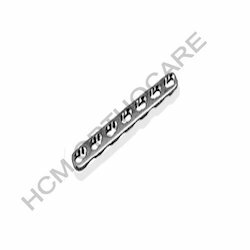 A qualitative range of LC LCP 4.5 mm Broad with Locking System is offered by us to meet the rising demands of the market. We offer these at market leading prices to our clients. Our company provides a diverse range of LC LCP 3.5 mm Locking Compression Plates . Various specific description of our product includes titanium: 04 to 012 (1 hole variation) and stainless steel: 04 to 012 hole (1 hole variation). We also offer warehousing and packaging services to our clients for their convenience. 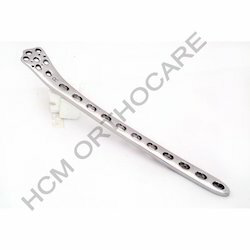 Our sound reputation as renowned manufacturers, suppliers, and exporters of a broad assortment Special Locking Plates has enabled us to present Distal Femur Locking Plates that are used for fixation of femur fractures. We use the finest grades of metal alloys to manufacture these and comply with rigorous quality checks that are in adherence with international norms. We use ultra modern technologies to manufacture these implants in latest manufacturing facilities. 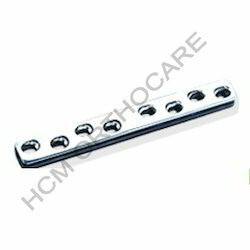 Our range of Locking Plates is appreciated by leading Surgeons and Orthopedics across the globe for outstanding performance. Our clients can avail these in different specifications at industry leading rates. 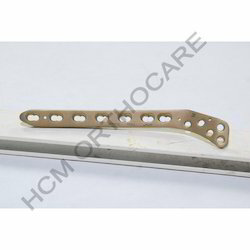 Our valued customers can avail of wide array of Special Locking Plates such as DHS Locking Plates that are commonly used during femur fracture fixation procedures. We manufacture these in our ultra modern facilities by using the highest grades of metal alloys. We stringently maintain strict norms of quality that are in agreement with preset standards of industry and manufacture these by using high end technologies. Our implants are widely acclaimed by the leading hospitals due to flawless performance standards. These can be availed at reasonable prices by our prestigious patrons. 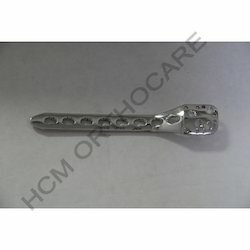 We are manufacturing of Proximal Humerus Plate With Locking System in our company both in Stainless Steel & Titanium material in good quality.We offer thesr at best market leading prices to our client. 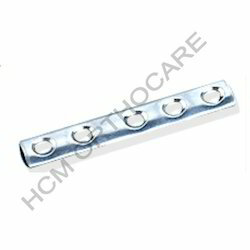 We have a qualitative range of Lateral Head Plate with Locking System is offerd by us to meet the rising demands of the market.This Plate suit perfect anatomical shape with bone. Material: Stainless Steel & Titanium. 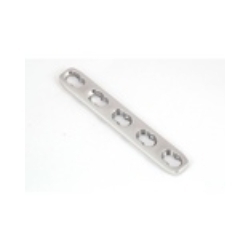 We are one of the trusted manufacturer, wholesaler, retailer and exporter of a wide range of 4.5 mm L-Buttress Plates for Right Leg that is made from high quality stainless steel. These are available in various sizes as per the needs and requirements of our respected customers. We offer these at industry leading prices across the world. Our discerning clients can avail a wide assortment of Reconstruction Compression Plates such as 4.5 mm Narrow Compression Plates that are designed in strict compliance with international norms. 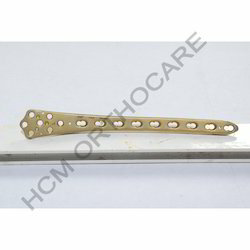 These are used commonly during orthopedic fixation procedures by leading orthopedics. We use the finest grades of metal alloys and manufacture these in our state of the art facilities by using cutting edge technologies. We follow extremely rigorous norms of quality that are in agreement with prevailing standards of the domain. Our implants are widely accepted by the leading orthopedics and surgeons due to unmatched quality. These can be availed at reasonable prices by our esteemed clients. We are a trusted manufacturer and supplier of a unique range of LC LCP 4.5 mm Narrow with Locking Nail System, which is made from high quality stainless steel that had been obtained from certified vendors. 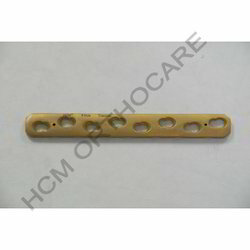 Its various description includes 05 to 010, 1 Hole Variation 05 to 016 Hole. These are highly demanded in hospitals, clinics and nursing homes. Looking for Special Locking Plates ?